UPDATE, 10/10/18: Unfortunately, Bailey has yet one more surgical procedure to go. Click the heart icon at right to read the details on his Special Needs page. 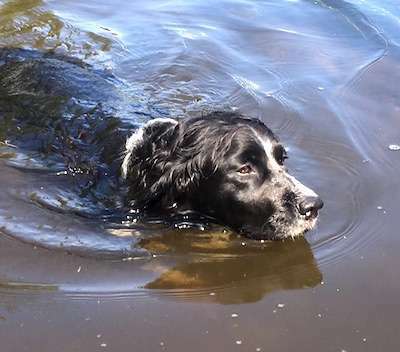 Bailey is an active Springer that came into our care because of a very unfortunate accident. 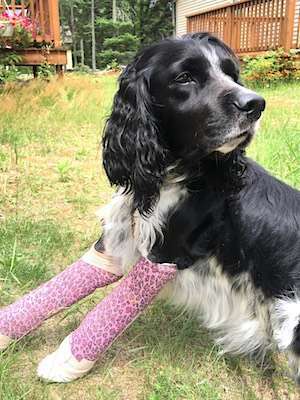 While he was playing with the children in his family, he ran into a railroad tie in the yard, which caused severe breaks to both of his front paws. As a result, his owners felt that it was in his best interest to turn him over to us for proper treatment and further care. This was a very difficult decision for everyone, as Bailey was a much-loved member of their family. ESRA sprang into action and attended to Bailey's needs immediately. He has now been accepted into our Special Needs program, where fundraising will take place to help offset his hefty medical expenses. 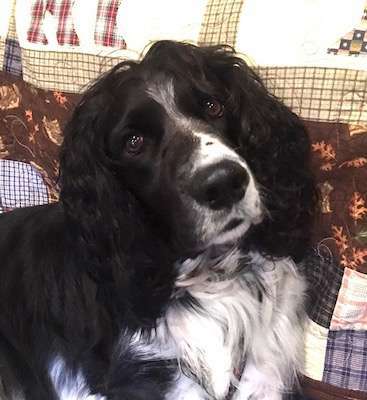 Poor Bailey has had to make some major adjustments as a result of the change in his family situation and his recent medical needs. 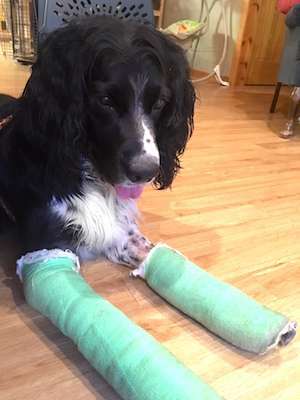 He was very fortunate to have two amazing ESRA volunteers, a husband and wife who are both veterinarians, step up to foster him and commit to caring for him through a surgical procedure and follow-up treatment to make him healthy and happy once again. Bailey was brought up to date on vaccinations once he was with ESRA, and he will soon be neutered. He lived with cats and dogs in his previous home, and he got along well with them all. He loves children, too, and he is good with kids of all ages. His previous owners' family had young girls who loved to play dress-up with Bailey, and he was tolerant of being adorned with human clothing. He's just an all-around great dog! Bailey is housetrained and crate trained, and he seems to find refuge in his crate. It is his safe place. He is good on a leash when he walks, but he did tug a bit when walking with the other canine in his former family. He loves belly rubs and cuddles, and he likes to give kisses! He knows basic commands and was trained to an invisible fence in his previous home. Fast or loud things tend to scare Bailey. He used to hunt, but he has grown out of enjoying that lifestyle. The noise of a gunshot seems to trouble him now. He will howl at the town's noon siren. Bailey does enjoy car rides and playing in the water. He has never been formally groomed, as his owners used to groom him themselves. This handsome boy appears to have tolerated that procedure well. Once Bailey's medical needs have been addressed and the healing process has been completed, he will be looking for his Forever Home. He would make a wonderful addition to a variety of families. If you would consider adding Bailey to your home and your heart, please contact his case manager at the email address below.